Viewpoints 9: Extra-ordinary, for sure! This was challenging indeed for me due to the outside-of- your- country requirement. Sadly, summers in Europe, helicoptering over Australia and batik lessons in Bali have not been a part of my life. However, I did spend 20 years in Southern California and became imbued with the culture of Mexico. I chose as my subject a simple flower, the marigold, which has a special meaning as a symbol of the dead. Every year on November first and second, the Aztecs relive a little of their past with the Dia De los Muertos, or Day of the Dead. Huge altars are set up with food and drinks are given to the deceased members of the household. No altar is ever complete without the gathering of the wild marigolds and the spreading of them everywhere from the family altar, to pathways, and even in the graveyards. This can be traced, in part, to the ancient Aztec celebration of Death. Often in Mexico today the family will visit the cemetery where their loved ones are buried and bring them offerings. 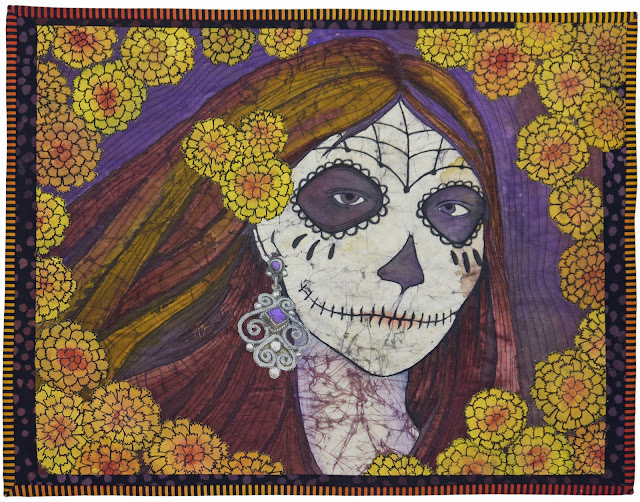 The main offerings given across the board, rich or poor, are the marigolds, or Flor de Muertos – Flower of the Dead. The flowers are thought to bring out the dead souls to feast on the offerings laid on the table or headstone. Today the flowers are prized by gardeners the worldover for their long lived blooms that love the heat of summer. They are to be found in gardens across the world, a testament to the wonder of this wonderful flower of the dead. This piece is really stunning. I love the play of violet against yellow. Marigolds certainly don't look ordinary here. Oh the humble Marigold! not so humble here. Betty I love the sentiment and colour of Festa de los Muertos, what I have seen of it in the USA, but didn't know the story of the marigold. Did you dye paint this amazing picture? it's soy wax & Dye-Na-Flow, Sue, will try to do a blog post on it. Thanks Kate, huge compliment from a master such as yourself!! Marigolds! Who knew! I will look at them in a whole new way now. I always liked them in my garden but now they will have another layer of meaning. Thank you, Betty! Captivating piece, Betty! The pale cracking skin against those colors (are those your eyes, again?) I've always thought that Dia De los Muertos was a wonderful idea for keeping the memories of those gone alive. I didn't realize the significance of the marigold in Mexican culture - I knew they come up in others. The marigolds also have similar meanings in Chinese culture (nearly the same as Mexican culture)! We also use it in temples and certain ceremonies. I love the facial expression of you quilt!